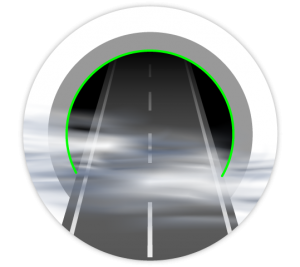 Is a system consists of technical and modular aims to increasing road safety, visibility and guidance support, even in unfavorable weather conditions. It gives 2-dimensional or 3-dimensional paths of visible and secure signaling by making visible road edges, roundabouts, crossroads, concealed entrances, zebra crossing. It is a Laser active “SMART” signaling system that creates bright 2-dimensional and 3-dimensional clearly visible references, that increase road safety even in dense fog, dense rain or snow. Where no widespread illumination is needed, it is used to illuminate road paths, especially those that are extra urban or private roads, with very low energy consumption and low maintenance costs. This system is characterized by a greater efficiency and lower power consumption of LED lamps, can define the visual and safer patterns in the fog, low building, operation and maintenance costs, reduce light pollution. The Laser is able to emit a light beam with a high spatial coherence, that keeps a Laser beam collimated over long distances, but it also has high temporal coherence which allows it to have a very narrow spectrum, i.e. it emits a single color of light. These properties, combined with high gloss, are the basis of the wide range of applications that Laser devices have and continue to have in the most several fields. A Laser beam can be clearly visible from more than 1Km, in heavy fog condition, without attenuation or dispersion (scattering) and it’s the only one artificial lighting system serviceable in unfavorable weather conditions. Road Edges which means illuminating the line of the road edge, it generates visible and safely bright references (or spatial patterns) both in the clear sky, in dense fog, or snow, avoiding accidents increasing the safety. Tunnels and galleries by illuminate the arch of a tunnel entrance. Crosswalk is a multi-color Laser system, and with projections on the ground of go/stop signal for cars and pedestrians o make even safer pedestrian crossings, especially in case of poor atmospheric visibility. Road construction sites define and make visible (even in fog) roadworks or hazardous areas for the circulation. Mobile Street Police Devices help officers to project in the direction of traffic, safety information to prevent further disasters or for directing traffic without departing from the vehicle. Ports of tourist marinas help the small tourist’s boats to find the way back especially in the night and in the fog. This system has a wide range of applications, from on-road (streetlamps) to mobile devices for traffic support and Policemen, and maintenance road companies. It integrates a multifunctional framework with a low-cost development platform to provide several Smart Mobility services.